Love cocktail bars with a difference? Then you’ll love Hidden Spirits. From 22 November pirates can set sail on an immersive adventure on the world’s first pirate ship cocktail bar. For three days each week, The Golden Hinde will transform into the Hidden Spirit a treasure-hunting vessel led by legendary adventurer Captain Jack Cassidy. This completely unique and mischievous night-out will allow guests to experience life as a pirate on the Seven Seas. Inspired by legendary characters synonymous with the Golden Age of piracy, Pirates of the Hidden Spirit will see guests recruited to Captain Jack Cassidy’s crew and given an opportunity to plunder the world’s finest treasure, including delicious cocktails. The year is 1795, Captain Jack Cassidy has been recruited by the US Government to sail The Hidden Spirit and recover a bounty of treasure, valued at $2million, that has disappeared in London. With the riches recovered, The Hidden Spirit is docked on the Thames before making the arduous journey back to America, but the ship is unable to set sail as the crew have mysteriously fallen ill.
Once on-board, guests transform into Jack’s crew and are given authentic pirate coats and three cornered hats. They are then warned by the ships Governor that the vast treasure, including all of the liquor and spirits contained within the chest, must return safely to America, with all acts of treachery and mutiny punishable by walking the plank. Directed to the gun deck, the first cocktail of the evening is served, the legendary grog that goes by the name of the Golden Shimmer. This luxurious cocktail is formed from pieces of gold taken from the treasure and must be sipped surreptitiously to avoid falling foul of the Governor. Crewmates are then served two further exotic cocktails within the bowels of The Hidden Spirit’s barrel deck. Five glorious grogs that celebrate the spirit of seafaring adventure are available, including Royal Docks (a Royal G&T with elderflower & Earl Grey tea), Beneath the Bridge (a salted caramel Old Fashioned) and St Mary’s Margarita (a Persian Lime & Nori Margarita). Visits to Pirates of the Hidden Spirit will last for one hour and forty minutes and cost £34.99 per person (includes 3 cocktails). Book your space on the ship and join Captain Jack Cassidy’s crew by click here. 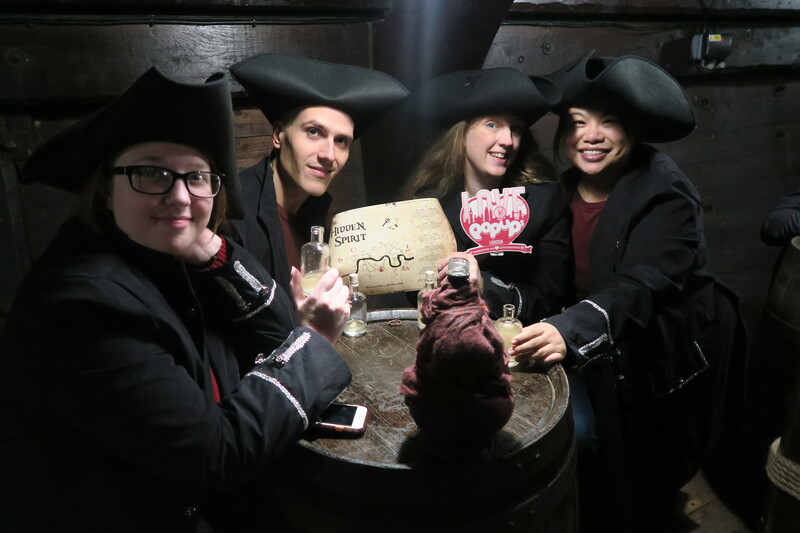 Thanks to Hidden Spirits who let some of us from Love Pop Ups London come along to swig back rum with other merry pirates. Read our blogs/reviews from the comments section below. On arrival you board the Golden Hinde ship. This a real deal ship as well, the one you may have busily walked passed many time. It’s a replica of first English vessel to sail around the world. Greeted by a pair of actors who tell us a bit of back story, we are ushered in and transformed into a fellow crew member. Jackets and bags gone, we are given pirate coats and three cornered hats to wear. The world’s first pirate cocktail bar…aye, all aboard skippers!